Spring Boot and H2 in memory database - Why, What and How? This guide will help you understand the concept of in memory database. We will look at simple JPA example to understand the best practices in using in memory databases. Why do you use an in memory database? What are the best practices in using an in memory database? How to connect a Spring Boot project to H2? Typical databases involve a lot of setup. Scenario 1 - Let’s consider a situation where you would want to do a quick POC. Using a traditional database involves a lot of overhead. You would want to be able to run them in parallel - multiple developers might be running the tests in parallel. In these kind of scenarios, an in memory database provides an ideal solution. An in memory database is created when an application starts up and destroyed when the application is stopped. H2 is one of the popular in memory databases. Spring Boot has very good integration for H2. H2 supports a sub set of the SQL standard. 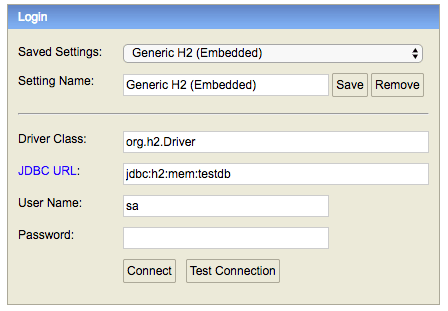 H2 also provides a web console to maintain the database. You need very little configuration to connect Spring Boot application with H2. In most situations, just adding the H2 runtime jar into dependencies should be sufficient. Ensure that H2 is selected in the dependencies. Create a simple Student Entity with a primary key id. When you start the application up now, you would see a lot of magic unfold! Its because of Spring Boot Auto Configuration. We will talk about this in the next section. How did all the magic happen? Let’s look at it question by question in the next section. Q : How does H2 and Spring Boot combination work? First and most important thing - Spring Boot is intelligent. If you are talking to an in memory db, by default, it looks at the entities and creates the database and the tables. However, if you connect to a mysql database, Spring Boot knows that its a permanent database. By default, it expects you to set up the database, set up the tables and it uses the connection that you established. Q : How did the Spring Boot Application connect to the database H2? Its down to Spring Boot Auto Configuration! First thing you would need to understand is Spring Boot Auto Configuration. It knows that you are using an inmemory database H2 and it uses the default url if you don’t provide one. Spring Boot auto-configuration attempts to automatically configure your Spring application based on the jar dependencies that you have added. For example, If HSQLDB is on your classpath, and you have not manually configured any database connection beans, then Spring Boot will auto-configure an in-memory database. Q : Why is the data lost between restart? H2 is an in memory database. Its not a persisted database. H2 is a great tool for learning because you need zero setup. Usually, the table’s are created but the url used in H2 GUI Console is wrong. 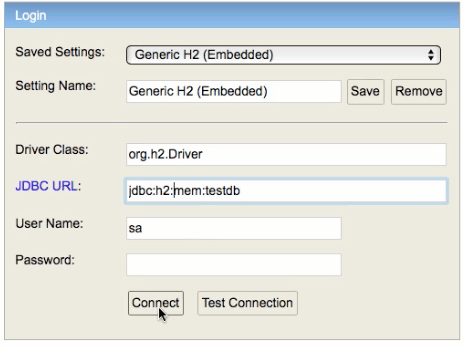 In the browser, change the database url to jdbc:h2:mem:testdb (Shown in the screen below). Error : H2 Console is not Launched up? Q : How did the insert query from data.sql run at application startup? That’s part of the Spring Boot startup routine. Any queries in data.sql are run at application startup. You can read more here. With this configuration, the data is not lost even after spring boot restart and computer restart. You would find H2 being very rarely used in this way. If you are really interested in a persistent database, we recommend exploring MySQL, Oracle or some other relational database. The standard properties file that Spring Boot picks up automatically when running an application is called application.properties and resides in the src/main/resources folder. If we want to use different properties for tests, then we can override the properties file in the main folder by placing another file with the same name in src/test/resources. The application.properties file in src/test/resources folder should contain the standard key-value pairs necessary for configuring a in memory connection. First add the dependencies for your database driver (mysql in the example below) and make the dependency for h2 test scoped.